RAPAPORT... Alrosa has reduced its full-year sales outlook amid weaker demand for small stones in the second half, the miner said Thursday. The company expects to sell 37 million to 38 million carats this year, down from the 39 million to 40 million carats it forecast in June. The miner has seen a shift to higher-value diamonds this year as the smaller categories performed less positively. Revenue grew 20% year on year to RUB 68.58 billion ($1.04 billion) in the third quarter, as a 35% jump in the average price to $155 per carat outweighed an 11% decline in sales volume to 6.7 million carats. Net profit surged 87% to RUB 24.23 billion ($365.9 million) due to stronger diamond prices and lower costs. “Our strong financial performance was driven by the recovery in demand for end products and higher prices, coupled with our efforts to improve margins through a more aggressive sales policy,” said Alrosa CEO Sergey Ivanov. Revenue climbed 11% to RUB 234.19 billion ($3.54 billion) for the first nine months of the year, while profit jumped 33% to RUB 82.49 billion ($1.25 billion). Alrosa expects production to decline 8% to 36.6 million carats for the year, compared with 39.6 carats last year. The decrease was due to the closing of the Mir underground mine in August 2017 after a flood killed eight employees. Group production will increase to 38 million carats next year, the miner predicted. The miner’s new Verkhne-Munskoye asset in Yakutia, which began commercial production last month, will provide an estimated 1.8 million carats per year, partially offsetting the lost volume from Mir. 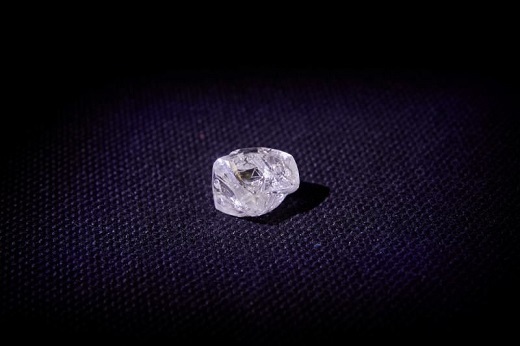 Yesterday, the company reported it had recovered a 51.49-carat gem-quality stone from the new asset.